What type of gladiator was a Rudiarius? A Rudiarius (pl. rudiarii) was a gladiator who had been granted his freedom. His freedom could be obtained if a gladiator bravely distinguished himself in a particular fight or, at some periods during Roman history, had won five fights. The symbol of freedom given to a Rudiarius was a wooden sword called a rudis. The term Liberatio referred to the freeing of a gladiator who had served his time as a gladiator and fulfilled his contract. The games had a political purpose. The more spectacular the games, the greater the enjoyment of the 'mob' and the greater the popularity of the man who had sponsored the games. The sponsor of the gladiatorial games was called the Munerarius (Editor or Editores). During the period of the Republic a wealthy and ambitious politician would 'buy' the votes of people, and increase the standing of his family, by sponsoring games. By the end of the Roman Republic Julius Caesar owned so many gladiators that the Senate, realising that so many Gladiators were equivalent to a "private army", passed a law limiting private citizens to owning no more than 640 gladiators. It would be reasonable to assume that some of these gladiators, the best in Rome, would have been a Rudiarius. After the assassination of Julius Caesar in 44 BC and the start of the Roman Empire the roman emperors and the state financed most of the games. Who decided that a Gladiator should receive his freedom and become a Rudiarius? The popularity of the Munerarius (Editor) was an important element of the Gladiatorial games. The decision as to whether a Gladiator died, or was granted his freedom and became a Rudiarius, lay firmly with the mob of spectators. The spectators demonstrated their decisions by yelling and screaming but also by the Pollice verso - a gestures with "With thumb turned". The Roman spectators were oblivious to the plight of gladiators and the occasions where they called for life were very limited. An Editor, who might have the unlimited power of a Roman Emperor, would have been a brave man indeed to go against the wishes of the 'mob'. Therefore the initial decision on who should be granted the rudis and become a Rudiarius was the crowd and the Editor had the authority to grant it. The Ceremony surrounding the granting of the wooden Rudis and therefore creating a Rudiarius was fairly unusual. It provided a diversion for the crowd and required due pomp and ceremony to be associated with it. The munerarius (editor), possibly the Emperor, would go to the center of the arena and give the wooden sword (rudis), the symbol of freedom, to the brave gladiator, signalling that the gladiator was no longer a slave, but a freeman - a Rudiarius. The crowds would cheer and the Rudiarius would walk from the arena as a free man and one that was idolised by the 'mob'. A Rudiarius could never be Roman citizens, their children could. There are several stories about famous Rudiarius which were documented by Roman scholars and writers. The Roman Emperor Tiberius (r. 14-37 AD) once offered 1,000 gold coins to retired gladiators (Rudiarius) who would agree to return to the arena. A famous Secutores gladiator named Flamma, is known to have turned down retirement - an incredible four times, he was eventually killed in his 34th gladiatorial combat. Two famous gladiators named Priscus and Verus fought so evenly and courageously for so long that when they both acknowledged defeat at the same instant, the Roman Emperor Titus awarded victory to both of them, presented them with the wooden swords (rudis, rudes) and they both walked from the through the Gate of Life as Rudiarius. This type of fight was referred to as Stantes missi - a draw, with both "sent away standing." 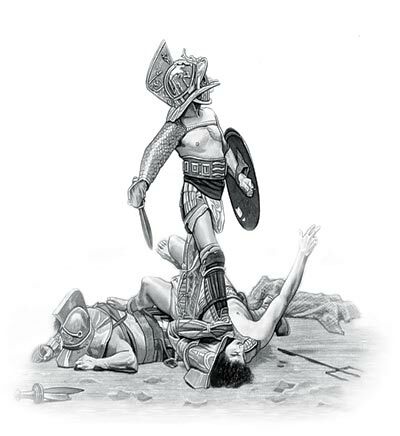 The content of this Rudiarius category on the different types of gladiator who fought to the death in the gladiatorial combats staged in Ancient Rome provides free educational details, facts and information for reference and research for schools, colleges and homework. Refer to the Colosseum Sitemap for a comprehensive search on interesting different categories containing the history, facts and information about Ancient Rome. Interesting facts and information on this type of gladiator: their weapons, their armor and their style of combat.